Promoting the upcoming DVD release of Quantum of Solace, Daniel Craig spoke with the Herald Sun about how Sebastian Faulks' Devil May Care might be translated to the screen. Says Craig, "Have you seen that terrific series Mad Men? It’s great and I look at that guy (Jon Hamm) and he’s got such a great look. 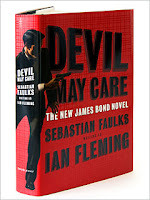 If you were doing the film of Sebastian Faulks’ Bond book (Devil May Care) that look would be perfect. If you were doing a one off film I would say that’s the way you would go." So does this mean we might we see Daniel Craig's 007 in the true world of Fleming's Bond? Unfortunately, no. After suggesting this very appealing idea, he gets back on message and shoots it down. "But that’s not where we are. The intention was always to make more than one of these so we have to move it forward because in two years time when hopefully we’ll do another one, we’ll still be pushing it forward. If we’d have gone for some cute idea of what it was in the past, some kind of retro thing, it just wouldn’t move it on." Frankly, I don't think Craig's heart in in this second statement. I think he'd love to prowl through Fleming's world as 007. Craig is correct in pointing out Mad Men as a way to make period seem fresh and new. But Eon appears to be dead set against ever moving James Bond back into his glory says (as IFP has done, with tremendous success, in the books). But it took filmmakers over 30 years to finally send Sherlock Holmes back to the Victorian era. Holmes was presented as a contemporary figure in film well into the 1930s (battling gangsters and wielding high tech gadgets). It wasn't until The Hound of the Baskervilles (1939) that Holmes was finally done in period, and it's not a coincidence that this was the first hit Holmes film that laid the templet for all that followed. I do hope at some point in the future we will see a period James Bond film, even if it's just a one off.